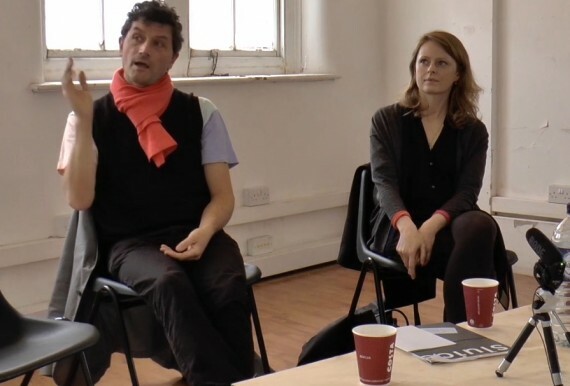 Over the next month, Sluice_ will be posting video footage of its recent talks programme which took place during Sluice_2015 in London, and looked at a diverse range of topics including public art, copyright and the abstract revival. The third edition of Sluice_ art fair, which took place in October, included an a-n supported series of talks alongside the artist/curator focussed gallery presentations and performance programme. Speaking before the fair, Sluice_ co-director Ben Street described the talks as “an opportunity to discuss, address and unpick aspects of contemporary art that we feel are worth investigating” and added that topics up for discussion would include “public art, contemporary art in historic settings, and the rights of digital artists”. For those who weren’t able to attend, Sluice_ is posting recordings of the talks programme online, with the first one already available. Art in the Public Sphere posed the question, what does it mean to make ‘public art’? with artist Simon Periton and public programmer Jennifer Thatcher exploring how working with art in the public sphere affects art, artist and the public. Over the coming week’s, recordings of further discussions will be posted including: Copyright / Copyleft with panellists Laura Davidson, Masha McConaghy and Keh Ng discussing the effect digitised art has on our perception of creative production; a discussion about the role, function and value of a university art gallery with Gavin Wade, Matthew Cornford, Andrea Phillips; and a conversation led by Piers Veness, Enrico Gomez and Juan Bolivar about the current revival of abstract painting. Plus catch up with artist Marion Piper’s ‘take over’ the a-n’s Instagram feed during Sluice_2015, where she was on hand to capture events during the four day fair. Sluice: more of a happening than an art fair – Dany Louise reviews the 2013 edition.